The DMCs have come a long way since DJ Roger Johnson won the debut world title way back in 1985. Vinyl is no longer mainstream. From multi-click orbits to mind-boggling beat juggles, DJs have mastered an almost endless list of tricks. And turntablism has now fully embraced the digital age. With the country's finest going head-to-head on 2 May, UK All Day collared last year's DMC Online World Champion Jon1st to talk shop. What inspired you to buy a pair of decks and practice to a world-class standard? Around the age of 11 or 12 I was listening to a lot of mainstream rock music. One of the bands I liked at the time was Linkin Park and they featured on a song by The X-Ecutioners, a famous turntablist crew from New York. I remember buying the single and being completely blown away by the B-Side, a track called X-Ecution Of A Bum Rush featuring the Beat Junkies . It was an all scratch track with beat juggling, scratch drumming, cutting etc. I'd never heard anything like it and I knew as soon as I heard it that I wanted to discover how the sounds were made and learn how to make them myself. A few years later, after I had bought decks, I came across the UK 2003 DMC video and it opened my eyes to the battling world. I picked up the 2001 World Finals DVD soon after and I was hooked! Were there any techniques that you struggled to pick up back then? I don't think new techniques ever become easy to learn, even if you've been learning for a while. I still struggle every time I learn something new! After the basics, where your hands are working in unison, each technique requires you to move your hands independently of each other - a bit like that party trick where you rub your stomach and pat your head simultaneously - so each takes some time and practice to learn, and a lot longer to master. Fortunately I had access to the internet when I was starting out, so I had access to tutorials and could seek out tips and advice from other DJs on forums and message boards when I got stuck in a rut. While the learning curve is quite steep, there's a lot of help online for new turntablists, particularly these days with YouTube, so it's a lot easier to learn new techniques once they're established. If I was to name one technique that I found difficult to learn, I'd most probably say flaring. I was locked in closed fader techniques for quite a few years and I couldn't get my muscle memory to click with open fader techniques for ages! Do you have any favourite scratch techniques? I really like incorporating pitching by pushing the record faster or slower when I scratch. That's one of the things I really like about turntables. I can't think of many other instruments that are both percussive and melodic at the same time. Whenever I learn a new pattern or technique I always experiment with pitching variants. I feel it makes scratching sound a bit less robotic and more musical. Are there any DJs or DMC routines that have inspired you? There's a lot so I'm guaranteed to leave out a few but in terms of battle DJs I'd say Woody, Muzzle, Kentaro, ie.MERG, Craze, Precision, 2tall, Unkut, Pfel, C2C and A-Trak, particularly after he won the DMCs. After he retired from battling, he went on to perform a lot of showcases and one that had a lasting impression on me is his guest performance at the 2001 DMC World Finals. In terms of club DJs I'd say Mr Thing and Buddy Peace have been big inspirations. Are you competing in the UKs this year and who are your favourites to win? I'm not competing this year as I've been focusing on DJing and production but I will be performing a showcase of a few of my routines. I think Ritchie Ruftone has a strong chance of winning the UKs again this year if he defends. Outside of the UK, three of my favourites that are currently battling are Vekked from Canada and Precision and I-Dee from the US. 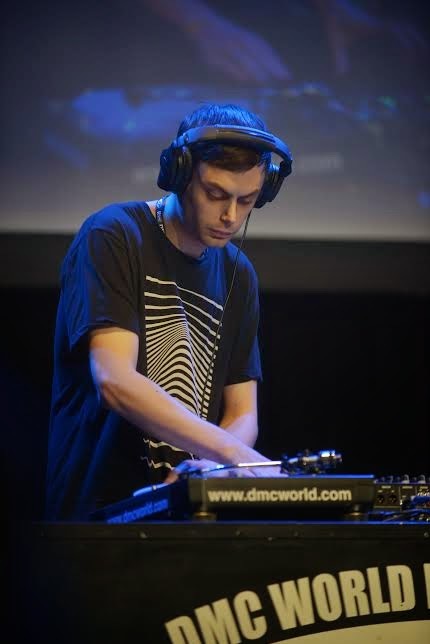 Vekked won the DMC World Supremacy in 2012 and the IDA World Championship in 2012 and 2013. Although our styles are quite different from one another, we have a lot of shared views on battling and I really respect how much he dedicates to progressing his style and pushing himself to improve. Precision has come so close to winning the Wold DMC title so many times and I feel he really deserves it. He's one of the illest beat jugglers of all time in my opinion and is really inventive in his approach to routines. I really hope he enters this year. I-Dee is an all round sick battle DJ I've been watching since I first discovered battling and I heard that he recently won a heat in the US, so will be competing in their national finals this year. I really hope either one of those guys wins in the US nationals, they'd both be a serious force at the world finals! There are two types of DJ – the turntablist with all of the technical ability and then the guy who mixes, has an ear for songs and can rock a crowd. How important to you is club DJing? I actually consider myself a club DJ first. When I play out I'd say I'm 80% focused on the crowd and entertaining them within the boundaries of my music tastes. The other 20% is adding scratching, trick mixing and how I mix. I want to make people dance first and foremost and then add an extra layer of skills. If I'm performing a showcase I'll adjust the balance a bit. I recently played at The Community Skratch Games in Galway where the balance between scratching and working the dance floor was about 50/50. I don't think there's necessarily two strict polar opposites of a hip hop DJ. I know quite a lot of DJs who balance their time between digging, producing and the turntablist side of things and are able to excel in a number of scenarios. My goal has always been to be as balanced as I can be. For years the DMCs were sponsored by Technics, which meant you were limited to their equipment and everything was analogue. Since they shut up shop new technologies like Serato have emerged, with Rane now sponsoring the competition. How has that changed the event? It's an interesting argument. Like you say, DMC now allow DVS (digital vinyl system - Traktor, Serato etc) in their six minute and team categories, meaning that DJs have no limitations when it comes to music choice, as well as access to digital features like looping, cue points and software and hardware effects. On one side of the argument it's a big step away from what DMC was in the 80s and mid-90s: back then everyone was using original 12"s and you were limited to what you could find on records anyone could buy in the shops. A few years later, battle breaks appeared, which were essentially records featuring lots of sounds and beats lined up for DJs to access quickly, so you could potentially make more composed routines without having to change your records as much to get to different sounds you wanted to scratch or juggle. Then in the 2000s, it became really affordable to write a custom routine using a DVS bespoke to your needs and then press it to a custom 12" record yourself, so you have a record no-one else has with all your sounds lined up - essentially a custom battle break - so you could pack a lot more into your routine and define yourself with a more personal set of sounds and beats. You could even produce your own tracks for the battle if you wanted to. By the end of the '00s, the vast majority of battle DJs were using these dubplates and it made sense to allow DVS: it meant DJs didn't have to pay to press dubplates and could continue crafting complex sets until the day of the competition. It also meant the sounds the DJs were using wouldn't wear out as they're cueing digital files rather than physical sounds. To me it's a logical step and something I fully support. While I respect the traditionalists who want the competition to remain how it was in the 80s in terms of equipment, that limitation doesn't reflect how DJs perform 30 years later in my opinion. A lot of music isn't released on vinyl any more and the vast majority of DJs now are playing out and performing using DVS or other digital mediums, and I think the change in the rules reflects that. DMC still allow DJs to enter with traditional vinyl if they wish, so if that's how a DJ wants to present themselves they still have that option. DVS won't make a bad DJ good but will give a good DJ more tools to incorporate into their performances. DMC's judges are all past national or world champions, and are all able to recognise the skill involved. If an incredible DJ using purely traditional vinyl surpassed a group of DVS DJs in DMC, the judges would score them as the winner. Some have criticised the fact that making custom records means it can be more difficult for the audience to understand how the beats are being manipulated, especially if they don't recognise the songs being juggled. What's your take on that? I personally don't think a DJ should dumb down their style by using tracks that everyone recognises. They're sacrificing their own style and tastes to appeal to a wider audience, unless that's their style of course. DJs should use whatever tracks they're personally feeling but that doesn't mean what they're doing is going to be lost on the audience purely because they don't know the song that they're juggling or scratching. In my own routines I always play a few bars of a beat through before I start flipping it. That way the audience can get a feel for how the record sounds without scratching and juggling, so they have a reference point even if they don't know the song. There is a downside of DVS, and custom records before them, where it's possible for a DJ to produce a routine that sounds great but doesn't actually involve much skill, where the DJ is simply triggering cue points one after another. For example, a DJ could make a track with lots of crazy drum fills and big explosions and then manually loop it with spin backs. It's going to sound crazy and the audience is going to go mad for it, but the DJ is just looping two records on beat - the most basic of beat juggling techniques. Another example is where a DJ has edited a song so it plays over two decks and they have their sounds laid out on their DVS files so that they can play sounds in succession by swapping from deck to deck to cue the next sound in their arrangement, again producing a routine that sounds complex but is technically very basic unless they throw more fills and techniques into the mix. If a DJ takes this approach, they're only really showcasing their production or arrangement ability and not really showing off their ability to flip records manually, which in my opinion is one of the main things DMC is about - progressing the art of flipping records in musical and inventive ways. They're letting the original song they've chopped up lead the routine, rather than letting their patterns and techniques be the centre point. Just to clarify, I'm painting an extreme example here and I don't think I've ever seen a set that is that basic - if DJs enter DMC, they know and respect its history. If someone takes this newer edited route, they usually use it as a skeleton for their routine and then flesh it out with more traditional skills. No one's going to try to fake a set. The judges would pick up on that. Exactly. Judges know the deal and they're not going to award any points to something that isn't a true representation of the artform. A set like that might be a fun routine to listen to or experience in a club, and if that's your style go for it, but the judges are all past champions so they can look at things from a technical standpoint. I've used elements of that style in my own routines so I can swap between sections of the records I've chosen really quickly and maintain the pace of my routines, so I can have a juggle routine over a track's intro followed by a scratch routine on the same track's bridge, then snap straight to a breakdown without having to manually cue it. In my opinion DVS allows you to write a more complete and personal routine and due to the nature of it being a standard in battling now, it forces DJs to really push themselves. DJs are cramming more and more techniques and sections into their routines, so you feel compelled to up your game and be as technically diverse in your six minutes on stage as you can. Connect with Jon1st on Facebook and buy your tickets for the UK DMC Finals on 2 May here.